Krafting Kreations: Make a Wish Come True! I have another fun card from the November Make and Take to share with you! 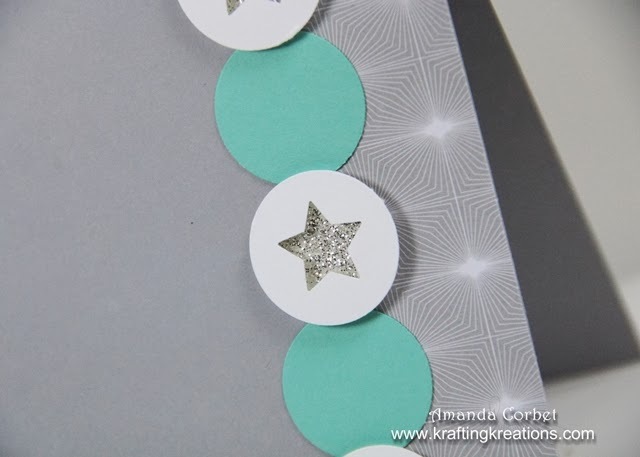 This one is a sparkly fun birthday card using some Winter Frost DSP. This lovely was cased from Laurie at Soap Box Creations. For this fun card I started off by cutting a piece of Smoky Slate card stock 4-1/4" x 11" and scored it at 5-1/2". Next I cut a piece of Winter Frost DSP 1" x 5-1/2" and adhered it onto the right side of the card front. 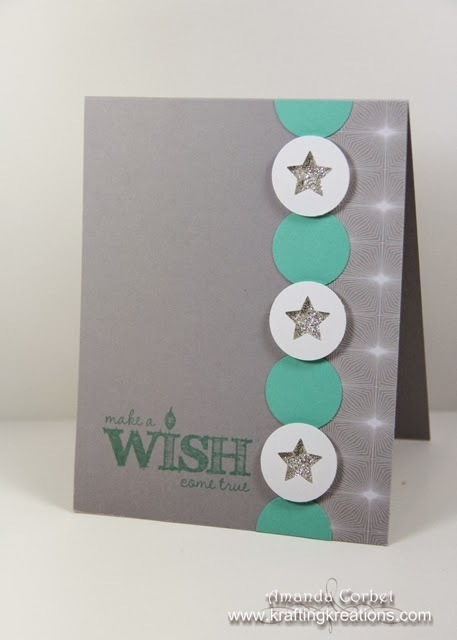 I stamped the greeting from Make a Wish in the lower left corner of the card front in Coastal Cabana ink. Now for the fun part! I used the technically retired little Star punch from the 2012 Holiday Catalog to punch a three stars in a scrap of Whisper White card stock with a couple inches between each star. Then I punched out the star shape with a 1" Circle punch. I used the 1" Circle punch three more times on some Coastal Cabana card stock then punched three circles from Silver Glimmer Paper with the 3/4" Circle punch. I cut one Coastal Cabana circle in half with Paper Snips then adhered each half onto the card front centered over the edge of the DSP. Then I adhered the remaining two Coastal Cabana circles evenly spaced between the top and the bottom of the card front. I adhered the Silver Glimmer Paper circles between the Coastal Cabana Circles with 2-Way Glue Pen. Now for the circles with the star cut outs I used a half a dimensional on each side and adhered these over the glimmer paper circles. 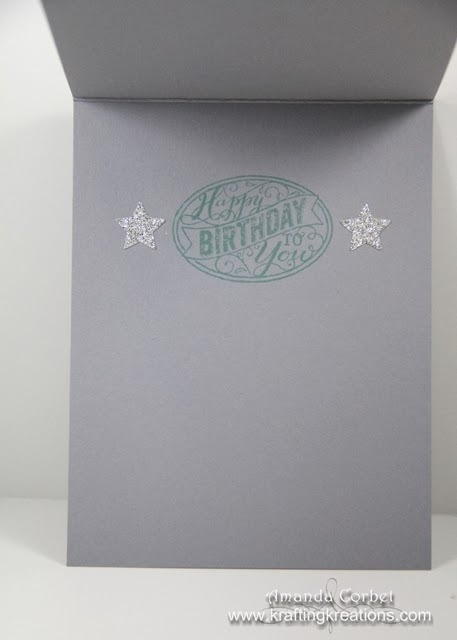 On the inside I stamped the Happy Birthday from Chalk Talk in Coastal Cabana ink and added two punched Glimmer Paper stars. This just goes to show you that just because the paper is meant for winter and Christmas doesn't mean it's the only way it can be used!